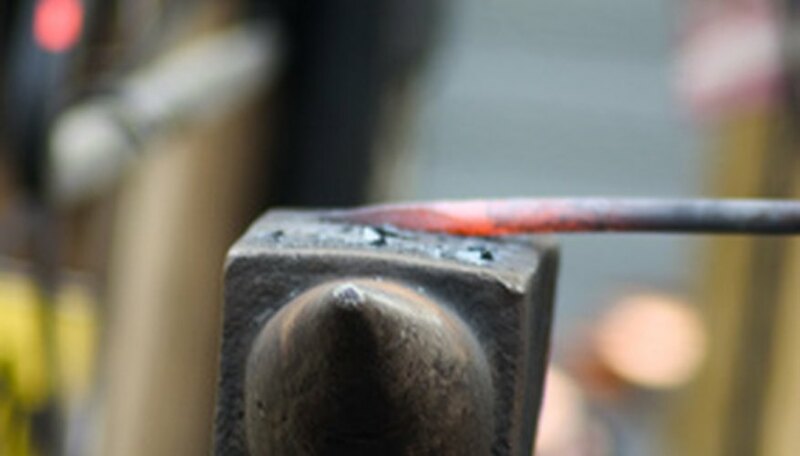 Blacksmithing, once considering a dying art, has seen increasingly popularity over the last ten years. Hand-forged items have risen in popularity, both for their value and their utility. Entering the blacksmithing field can seem difficult. What do you need to start your own shop? How do you construct it and operate it safely? Fortunately, building your own blacksmith shop doesn't take anything more than hard work and patience. Choose an area to build your forge in. Use an area that is fireproof and well-ventilated, as blacksmithing creates considerable fumes and other health hazards. Place your forge well away from any wooden walls, while leaving ample room around the forge area for tools. Construct a frame with the 2x4s at the height of your waist, approximately five feet by three feet in size, and then attach the plywood sheeting. This box should be able to hold concrete and allow it to set. Measure a hole for your air pipe approximately eight inches from the top in the center of the forge. Do this on both sides, and cut the circle out of the box. Insert the pipe through the hole, leaving six inches extending on either side of the box. Fill the box to the bottom of the pipe with concrete. Once the concrete has had 24 hours to set, drill 20 to 25 holes in the center of the pipe, making a circle. This is called the tweer. Construct a box approximately a foot square to cover the tweer, then fill the rest of the frame with the concrete. When the concrete is almost set, after 20 hours or so, remove the wooden box. You will have a foot-square area to fill with fuel. Let the concrete sit for two days to set completely, then attach the bellows to one end of the air pipe. Place your anvil near your forge, so you can place warm metal on it without turning. Use the freestanding tool rack to arrange your blacksmithing tools nearby. Rearrange as necessary to give you plenty of room to move. Blacksmithing tools are widely available online and in hardware stores; buy a kit for the best deal. Never burn coal or wood in an unventilated space. Your forge should be constructed in an area where you can quickly vent smoke and fumes. Seitz, Dan. "How to Build a Blacksmith Shop." Sciencing, https://sciencing.com/how-6606607-build-blacksmith-shop.html. 07 August 2017.